Many of our customers use our All-In-One for LAWNS because it not only fertilizes, but also aerates, dethatches, and bioactivates the soil with humates and seaweed. But there is another ingredient in this product that many customers are not really aware of, and that is the beneficial root fungi. These are commonly known as mycorrhizae ( my core Rye’ zay ). The mycorrhizae are capable of expanding the root capacity of the grass by 10 to 100 times, or more. Here is how it works: Mycorrhizae, which are naturally occurring soil fungi, form a mutually beneficial relationship with the roots of plants. Plant roots exude sugars, which the mycorrhizae like to eat. The mycorrhizae attach themselves to the roots of the grass and then stretch out, sending very fine filaments throughout the soil. These filaments bring water and minerals back to the grass root so the grass can be healthier and produce more sugars as well. Essentially, the mycorrhizae extend the roots of the grass and go into small places that roots can’t get to. Another fantastic benefit is that mycorrhizae also break through the bonds of clay particles and help restructure the ground into a more porous soil. The liquid aerating and bio-activating aspects of the All-In-One for LAWNS help make it easier for the mycorrhizae to do their job. 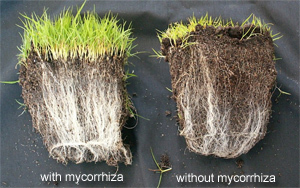 Is YOUR lawn currently benefiting from mycorrhizare?